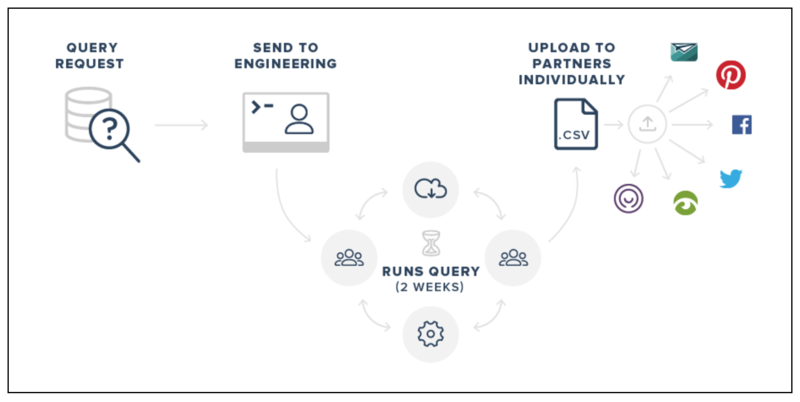 With data latency at the heart of the issue, in this article, we’ll address some of the challenges and payoffs to real-time audience building. Because the sooner marketers unlock the ability to act on their customer data, the better. Segmented lists allow marketers to splice and dice audiences for optimized outreach, but their strength diminishes as time goes on and the customer data becomes stale. Oftentimes, this is because the process of building a segmented list can be long, costly, and tedious. As a marketer, your request is not always at the top of the queue, which can take days or even weeks long to get to. And meanwhile, during the time it’s taken to pull and upload the data, people on your list may have taken an action, excluding them from the segment you were intending to place them into. These out-of-date segments often result in delivering messages to people who should not be targets, and misses people who should. The problem is that data has a diminishing value over time, and at at a certain point it becomes totally worthless (such as when someone has already completed the purchase you're recommending them), or even becomes a negative value (such as when mistargeted messages become an annoyance to consumers). Target audience data has diminishing value to marketers over time. But there is a way you can shift your position to a higher value part of this curve, unlocking campaign results far and beyond what was ever possible prior. With a data platform like mParticle’s, a non-technical marketer can define a segment of, for example, very active users and high spenders with only a few clicks. The ability to refresh segments constantly, in real-time, allows marketer to super boost tactics on RTB platforms such as Aarki’s. Regardless of the strategies or tools you employ, shrinking the time-to-action can significantly add value to your campaigns. All while creating a better customer experience, as you better match their expectation across the customer journey. Whether you’re retargeting an abandoned digital shopping cart or sending someone an upsell message, the ability to act on your customer data before it goes stale is essential to the success of any targeted campaign.